Year 1940 is the year of the dragon, the year in a hospital in San Francisco was born Lee Hsiao Lung. Doctors who deal with the birth of the baby, gave her English name, Bruce. Thus the legend was born. When 6-year-old little Bruce was acting for the first time in a movie called "A Beginning Of A Boy". This is not surprising because his father Lee Hoi Chun is a film actor. Bruce is a fragile child, including child he even fussy eaters. So when he got into a fight he lost street style. At that time he was 14 years old. After a discussion with his mother, he decided to learn martial arts. Type of martial arts that he learned was Wing Chun, he studied with Sifu Yip Man. He also studied with master kung fu Siu Hon Sung. Usually it takes three weeks to control 30 moves Siu Hon Sung, Bruce Lee only needs three nights only. Besides, Bruce Lee also had fencing skills from his father. There is one unique thing, Bruce Lee was not only adept at martial arts. Turns out he was clever dancing cha-cha and even in 1958 he won the trophy Hong Kong Cha-Cha Championship. Over time, Bruce lee kungfunya eager to test skills in a real fight. So he was involved in a street fight. Police warn the mother if Bruce did not stop his behavior then he will be arrested. Then his father made the decision to send Bruce to the United States in order to become a more responsible jawab.Dengan armed U.S. $ 100 he went to his native San Francisco by ship. On the way Bruce still managed to make money by giving dance lessons cha-cha. In San Francisco, Bruce entrusted to his father's friend, Ruby Chow, the owner of a restaurant. Bruce had come to work at the restaurant. After finishing high school, Bruce still keen to build his physique. Not enough for him just to be a martial arts expert, he should be the best. Bruce was then decided to go to college in Seattle and majored in philosophy. At the university he met a fellow from Asia called Taki Kimura Kimura had experienced a series of racist attacks. Based on compassion, Bruce motivate Kimura to raise his self-esteem by training her martial arts. This is the forerunner to the kung fu martial arts school and not long after the school was established. The school is open to the public or for anyone interested. In stark contrast to Hong Kong. In Hong Kong, kung fu was a secret science should not be taught to people at random. Only gentlemen are allowed to learn kung fu. In 1961 he met a girl named Linda Emery. They fell in love, got married, and followed Brandon Shannon was born two years later. Van Williams, star of the Green Hornet, tells of the many stunt-man wounded by Bruce movement, consequently difficult to find stunt-man who is willing to work with Bruce. Bruce also has a very fast movements to be captured by the camera so Bruce had to slow down the movement. After the project "Green Hornet" after Bruce opened the school's new kung fu again named "Lee Jun Fan Gung Fu Institute". This is where Bruce Lee learned to use weapons nunchaku. The celebrities had to learn kung fu in this place like Kareem Abdul-Jabbar, James Coburn and Steve McQueen. Bruce's popularity also increased and this increase the value of a Bruce Lee, for a one-hour training session for a set price 300US $. In the new school that also is Bruce created Jeet Kune Do techniques, engineering cutting attack. Bruce found cutting attacks better and faster than the last resist attack. With particular consideration Bruce decided to continue his film career in Hong Kong. Some films starring, now Bruce has been regarded as a national hero. Not content with all that, he opened his own company because he wanted to write a screenplay, directed, starred in the next movie. Again Bruce succeeded, some film production company is selling well. After numerous films made and successes achieved, on May 10, 1973 Bruce suddenly unconscious for half an hour when completing dubbing for "Enter The Dragon". The doctor prescribed him Manatol, drug used to treat the symptoms of brain swelling (brain development). On July 20, 1973, Bruce plans to meet with Raymond Chow and Betty Ting Pei, who will be one of the stars in the movie "Game of Death". At home Betty, Bruce complained of headache and then he drank Aguagesic, migraine headaches that usually consumed Betty. Then Bruce lay down, apparently asleep when the attack brain swelling came back. Finally Bruce died in the emergency room Queen Elizabeth Hospital. 1. He was killed by gangsters for refusing to pay protection money, a common practice Hong Kong's role in the film industry at the time. Regardless of these speculations, the medical facts mentioned Bruce died after going into a coma due to cerebral edema, brain swelling due to excess fluid. Here are hal2 that you may not know about Bruce Lee. 1. 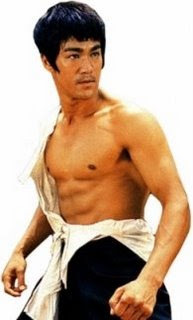 Bruce Lee has a congenital defect: long legs and big testes next door. 2. Bruce Lee actually wear glasses that are thick enough, and he uses a soft lens. Apparently in America already existing soft lens of antiquity. 3. Bruce Lee is not 100% Chinese, his mother Grace Lee is a crossbreed chinese and german, so to say Bruce Lee has a 1/4 German blood. 4. Bruce Lee first appeared in film at the age of 3 months. He brought his father, a well-known practice that Chinese Opera to appear in his first movie. 5. In an auction, a handwritten letter Bruce Lee to motivate himself with the title "My Definite Chief Aim" sold for U.S. $ 29.500. 6. Bruce Lee punch speed is 1/500 seconds from a distance of about 1 meter to the target. 7. Bruce Lee was a very powerful for its size, he can do pull ups 50 times with one hand. Bolo Yeung (aka Chong Li) who have never won that much big arm wrestling opponent Bruce Lee. 8. Bruce Lee could perform push ups with one hand only with two fingers (index and thumb) and sometimes with two hands, but only using the thumb only. 9. Bruce Lee popularized the technique of 'one inch punch' of boxing from a distance of 1 inch, and in a karate tournament, he was practicing on a judo champion from Japan, which weighs about 100 kg. Here we see pejudo was punched from a distance of 1 inch to lift both feet off the floor. 10. At the age of 13 years Bruce Lee studied at the Yip Man Wing Chun to study because at the time he joined a gang and often fights with other gangs. He thinks that his gang teman2'm not with him, what if he was attacked rame2. 11. There are three student Bruce Lee who never won a World Karate Champion: Chuck Norris, Joe Lewis and Mike Stone. 12. In the USA Bruce Lee taught kung fu to all races with no pilih2, and therefore he was challenged by another kung fu school with accusations of leaking secrets to the Chinese Martial Art of other races. Bruce Lee accepted the challenge and beat representatives from the colleges they will be in 3 minutes. Bruce Lee was disappointed, he said the fight must take place within a few seconds. From here he began to train harder, and found the concept of "Jeet Kune Do". 13. Movie Dragon The Bruce Lee Story starring Jason Scott Lee who is a movie that is not very accurate in depicting the true story of Bruce Lee. In the film Bruce Lee kicked his back, became paralyzed and had to sit in a wheelchair. In a real incident, Bruce Lee's injury because he was practicing with overload and cause spinal cord injury, and in fact he never sat in a wheelchair. 14. In a break from his spinal cord injury Bruce Lee for 6 months, created the book "Tao of Jeet Kune Do" which became a best seller. 15. Some time before the death of Bruce Lee, pa qua (a kind of talisman which is believed to ward off evil spirits) on the Bruce Lee fall breeze.